OptiShot keeps a record of every shot every player has taken. You can use these stats to analyze your swing and monitor any modifications you might make. To access the Swing Statistics window, click on Statistics on the Menu or use Ctl + Z on your keyboard. Initially this window will show the current player, the current club and statistics for the current session - that is, this Game or Practice session. The data is combined for all shots taken with this particular club, by this particular player in this current session. The data contained in this window is detailed below. The player whose statistics we are viewing. The period of time we want data on. The number of times this player has used this club over the selected period of time. The average distance hit with this club. We also include the Longest and Shortest distances hit. The average face angle for all shots. The average path of this players swing with this club. The average speed for all shots. Note, we also include the Highest and Lowest. The average tempo, that is, the time from backswing to contact. You can use this window to view statistics in a variety of ways. Use the Player dropdown to select another player and see their stats. Every player for whom OptiShot has statistics will be listed here. The Club list allows you to see the statistics for different clubs. Every club used by this player for the selected time period will be on the list. Obviously, these statistics are a powerful tool for analyzing your game. However, you may wish to see individual numbers rather than averages. The next section will show you how to do that. The Edit Swing Statistics window allows you to see every individual shot rather than the averages shown in the Swing Statistics window. To open this window, click on the Edit button at the bottom of the Swing Statistics window. Here we see that each shot is listed separately rather than grouped by club. You can modify what is displayed using the Player dropdown, to see another players statistics, or the Filter dropdown, to select a different time period. At the bottom of this window we have a Delete button that will delete any selected items in the list, and a Delete All button that will delete all of the displayed statistics. 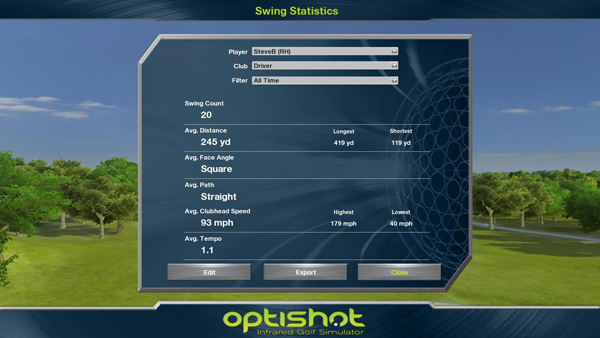 In the Swing Statistics window at the top of this page, and in the Shot Data display within OptiShot as well, we describe Face Angle, Path and Contact in words - for example Open 11.5°, Inside/Out or Extreme Toe. 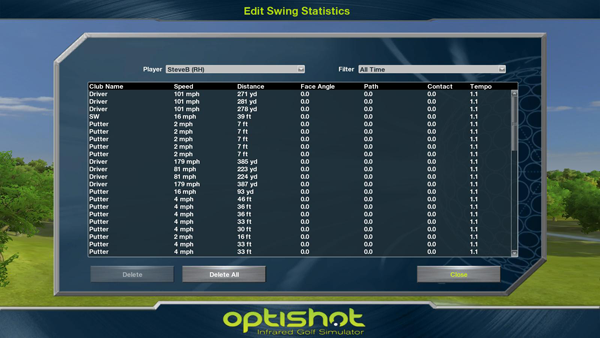 In the Edit Swing Stats window we do not have room for these and so you will see numeric values instead. Here we will explain exactly what these mean. This is your Club Face angle at impact measured in degrees. If you hit the ball square this number will be 0 (zero). A Closed Face will register as a negative number, an Open Face will register as a positive number. Above, we see a Face Angle of 1.0, this means the Club Face was Open 1°. We also see one that is -11.2 meaning a Closed Face at 11.2°. This is your swing path. A perfectly straight swing, that is, perpendicular to the sensors, will register as 0 (zero). An Inside/Out path will show as a positive number and Outside/In will be negative. Note that, because of the sensors on the Swing Pad, these will show as increments (approximately 0,2,4 and so on). Above we see the Path is either 0, that is the Swing Path was straight, 3.95 which means it was Inside/Out and -3.95 which indicates an Outside/In swing path. The possible paths are Extremely Outside/In, Outside/In, Slightly Outside/In, Square, Slightly Inside/Out, Inside/Out, Extremely Inside/Out. This is where upon the club face contact with the ball was made. 0 (zero) is the Center of the Face. Negative numbers indicate the ball was hit towards the Heel, positive numbers toward the Toe. -3 is Extreme Heel, -2 is Heel, -1 is Slight Heel, 0 is Center, 1 is Slight Toe, 2 is Toe, 3 is Extreme Toe. Note: These numbers hold true whether you are left-handed or right-handed. The easiest way to remember what these numbers mean is to consider whether the Path, Face or Contact is away from you or towards you. You can export your Swing Statistics into a csv file. This is a comma separated values file that can be imported into a spreadsheet application such as Microsoft Excel, Open Office Calc or Google Docs. To export statistics, open the Swing Stats window and click the Export button. This will bring up the Export Swing Stats window where you can enter the name you want for this file. Note: This will export the statistics for the selected player for the selected time period for all clubs.